The birth of the Renaissance and home to some of the most significant buildings, paintings and sculptures in art history is just the beginning of what Florence has to offer. Enjoy true Tuscan cuisine and the diverse nightlife of the city. Florence and the surrounding Tuscan countryside hold some of Italy’s most iconic images. See the David, get lost in the famous San Lorenzo leather markets, and indulge yourself with gelato. Saturday, wander around the city of towers in San Gimignano. Venture to Italy and explore the beauriful city of Florence! For accurate departure times, travel times, prices of activities, and suggestions on how much extra money you will need, please contact [email protected]. Aim to arrive into Florence Airport by 8pm. Upon your arrival into Florence, you will be able to check into our accommodation. Look for the blue hoodies to check-in with your tour leader. After breakfast, your trip leader will give you a walking tour of Florence. We will see the Duomo, the historic Ponte Vecchio, the Uffizi Gallery, Piazza Repubblica, Piazza Signoria, and more! 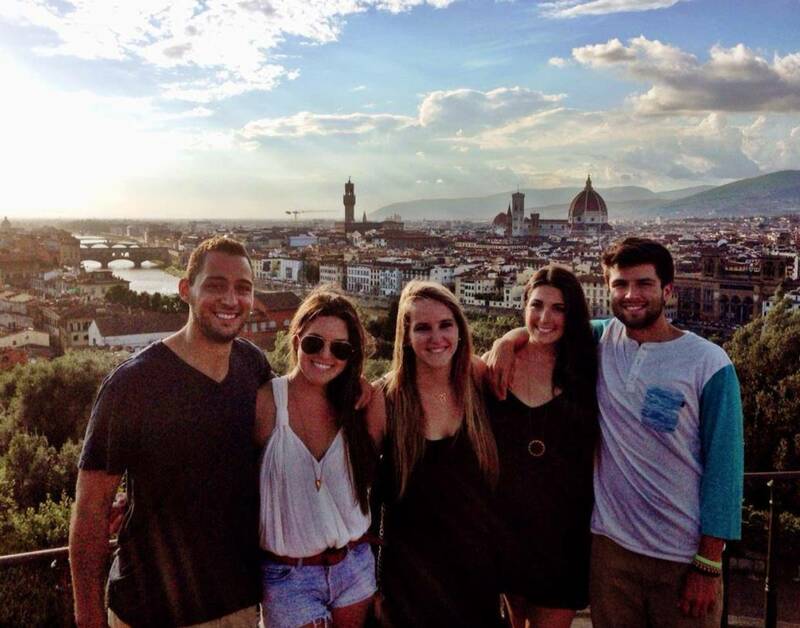 We will finish the tour in Piazza Signoria and your trip leader will direct you to some delicious lunch spots. Florence is known for its cuisine, and you will not be disappointed. The rest of the afternoon is yours to explore Florence. Your tour leader will meet you later on in the afternoon to take you to Piazza Michaelangelo, which overlooks the city, for a sunset view of Florence. Friday night there will be an optional family-style dinner at our favorite restaurant Il Gatto e la Volpe. The dinner includes several courses of Tuscan specialties and pastas. Afterwards we will head to one of Florence’s best bars and show you the local nightlife. The trip departs Florence from the Santa Maria Novella train station. The meeting point is in the International Ticketing Hall opposite tracks 8 and 9. Please meet your Trip Leader 20 minutes prior to departure. Travel to San Gimignano--One of the major wine regions of Tuscany-- is by private, luxury coach bus with A/C, DVD, and bathroom. The Chianti region boasts some of the world’s most exquisite grapes. Once we arrive at the first winery, Poggio Alloro, we will embark on our included wine tasting and vineyard tour. You will learn of the process of picking, making and bottling of this famous wine. Afterwards, you will have time to sample wine, browse the vineyards and take pictures with the charming backdrop of the Tuscan Hills. We will depart the first winery and head to San Gimignano. This charming area is a walled medieval town perched on a hill. Its well-preserved medieval towers can be seen from several kilometers away and have become iconic of the city. You will have time to explore the city. See the city’s fourteen towers, and the Collegiata and St Agostino churches with their works of art from famous renaissance artists such as Filippino Lippi. Our last stop is a local family owned winery named Tenuta Torciano. We will have a wine tasting of many local wines such as the Vernaccia di San Gimignano and Chianti Classico while enjoying a lunch of typical Tuscan appetizers and homemade lasagna with truffle oil. You will learn the proper way to hold the wine glass, smell the bouquet and taste in the way of sommeliers. After lunch, you will have a chance to purchase bottles of wine. We will then depart Tenuta Torciano for return back to Florence in the late afternoon. Check out is on Sunday morning. You will have the whole day until our departure back to Rome to explore any sites that you have not yet taken in during the weekend! You will have all day Sunday free to explore more of Florence’s endless beauty. Today you will be able to check out Florence’s great museums and galleries, like the Uffizi, Bargello, Accademia (home of the David), Pitti Palace, Boboli Gardens, and more. 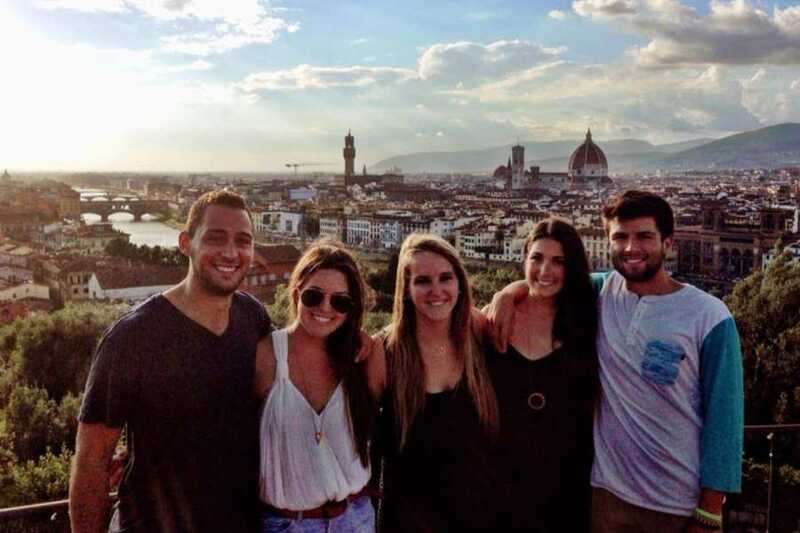 Or you may choose to head to Tuscany to visit the medieval city of Siena, push over the Leaning Tower of Pisa, or visit other beautiful cities in the region.Refer to your trip leader for recommendations and how to visit. The rest of the tour departs for Rome. Refer to your Bus2alps tour leader for departure times.